FIRST OFF, I WILL ADMIT I was sooo late to the table on this one. But nobody let me know! It turns out in April 2018, LinkedIn AGAIN changed their profile page design. It tightens the key information on your LinkedIn profile into most of the top third of the page (information like company name, college, contact info and total number of LinkedIn connections). Why this is important to you is that you may need to or (indeed) want adjust your LinkedIn graphics…especially the big display graphic. In my case, I very much like the ability to widen out that display graphic which, prior to the change on my page, just carried my brand logo. This display graphic layout seems to be much more flexible than the old version. Plus I get to highlight one of my favorite pictures of Bond Lake here in Cary where I walk in the early morning. I included the ducks at no extra charge! So anyway, if you have a display picture in your LinkedIn profile, just check to make sure it looks ok in the new dimensions. And if you don’t have a display picture, why would you throw away an opportunity to brand your business or have your LinkedIn profile page look incomplete…or at least like you don’t care or aren’t paying attention? Get ‘er done! Hope this helps. I’ve been spying on you. I know, I know, it’s not polite but I did it for your own good. 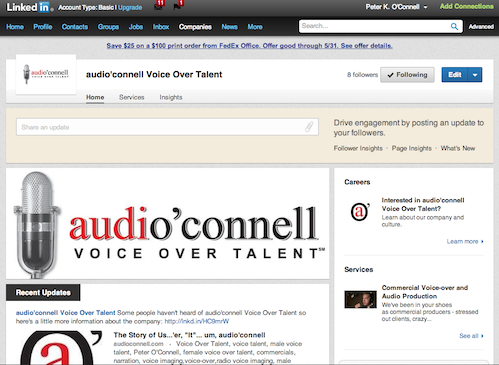 See I was going through my LinkedIn database, culling out voice talents for a client email blast I was doing. 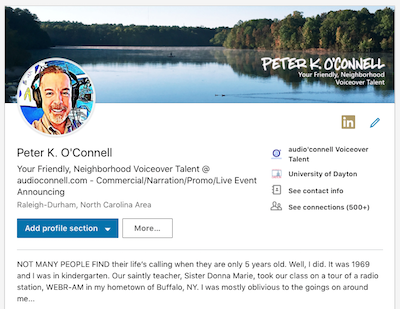 I noticed something odd about the LinkedIn listings of voice over talentsâ€¦many (but not all) seemed to forget that LinkedIn is both a social network AND a search engine tool. By search engine tool, I mean that your listing and text on LinkedIn are listed and impact your search results on all major search engines like Google, Yahoo and Bing! So why does your job title on LinkedIn say “owner”? You may be all those things and maybe they are listed on your business cards and letterhead but on the web, those titles don’t help you much. If you are a â€˜voice-over talent’, or â€˜voice talent’ or â€˜voice actor’, those terms have value on the web because very often (but not always), that’s how prospects search the web for folks like us. It’s a little thing but for organic web search, it can mean a lot. My simple point is this: with Linked In I think voice-over talents would be wise to be very keyword specific (and thoughtful) as they write their profile. Certainly, personality should come through in your writing â€“ LinkedIn copy shouldn’t be robotic just to please search engines. But I’m just suggesting a little more thought be put into the words you include in your LinkedIn profile. With LinkedIn being so incredibly business-centric (thus many of your prospects likely search for vendors or information on the site) the right content on your profile can initiate a profitable connection. There are likely millions of â€˜president’ and â€˜owner’ job titles on LinkedIn; there are also lots of people who have been in â€˜commercials’. 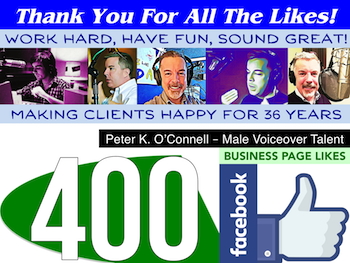 But on LinkedIn, they are not as many â€˜voice actors’ or â€˜commercial voice talents’ â€“ and that could make a big difference for you. So when WAS the last time you reviewed and refreshed your LinkedIn profile? Maybe now? How kind of you to contact me, your loyal member (your words not mine) to offer me in your email two free months of LinkedIn Premium! Um, but wait, it seems for this FREE opportunity you want me to give you a credit card number. Specifically MY credit card number. This confuses me. See, in my country, free is actually free meaning no financial transaction takes place. If the service is free then no money or credit card is needed. I have the card and I could pay the fee but I don’t know whether I see the value. This is why I’d be willing to try it for free for 2 months. I’m assuming you want to take my card information so that after the 60 days of free use is over, on the 61st day you can begin charging my card the $40/month LinkedIn premium fee. I say assumed because after you asked for the card, I stopped the process. I had a credibility gut check on you, LinkedIn. I started to doubt you…I never thought that way about you before. As a “loyal member” (remember? ), couldn’t we trust each other enough that you would pull the plug on the free option on Day 61 unless I contact you (LinkedIn) and said sign me up? Come on, we’ve been together going on 8 years. I’m loyal, you said it yourself. What’s the need for a free trial with credit card? That credit card number thing sounds a bit too siding salesman or used car salesman to me. It seems well beneath what I perceive (perceived) the LinkedIn brand to be about. But hey, LinkedIn, you have over 187 million members (I’m not sure how many of them are “loyal” like me) so you must know what you are doing. 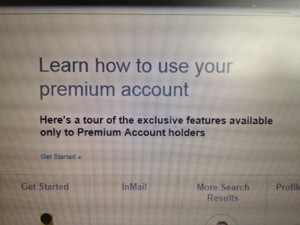 I’m going to pass on the introduction to your so called free trial for your LinkedIn Premium service right now. It just doesn’t feel very premium to me. And to be honest, neither does your brand at the moment.